It has become increasingly important for everyone to arrange for a backup plan for data, images, pictures, movies, audio and files present in the hard disks of laptops and other devices. If you are looking for such a solution, consider the Free Backup Software. This tool is effective in saving all such data that is important to you in hard drives, online or any storage device of your choice. The user can, in fact, make a few copies of the data and save them at various locations using this tool. The Free Backup Software can be used for personal as well as professional requirements and is quite simple for anyone to carry out the instructions. The files can be zipped and saved in any destination and can be accessed at a later date without any glitches. 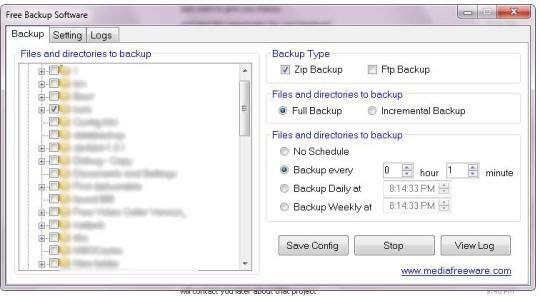 The users can create backup files for specific files and folders or the entire hard disk, depending on the requirement. It is straightforward software that allows the user to manage the important files in a way that is easy. Even novices can use this Free Backup Software in order to safeguard data that is very valuable. This is specifically designed for versions of Windows and has a simple user interface. Its convenience lies in its flexibility which allows users to select any language from a long list and build backup files that are relevant. Every user will agree that not everything that is there on the system's memory is important in case of an emergency. Therefore, this Free Backup Software is quite handy in such situations. The user can check the backup files which have been copied and make any changes as well. The time taken to retrieve the lost data is also very less, which makes it even better.